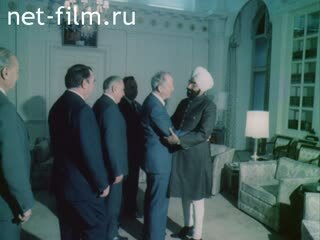 About the visit of the Soviet Delegation to India devoted to the 25th anniversary of Bhilai. 1h. - Working in the shops of metallurgical plant in Bhilai (India). Chronicle of construction plant. [_], Delhi: Republic Square, and others visit to the Soviet Union, Nehru and Indira Gandhi. 2h. - Preparation for the flight Soviet-Indian crew: training in Star City. The participation of the Soviet delegation in celebrating 25 years of plant: trip across the country. Guild Novokramotorskogo Engineering Works, where the camp was assembled for the 3600 plant in Bhilai. People ride bicycles to work. Working at the Bhilai Steel Mill, factory building. Shop factory, working at the furnace. Soviet and Indian specialists in the shop. The red-hot workpiece on the mill. Say, a factory worker, engineer and deputy chief of department. Streets, houses Bhilai (Madhya Pradesh). Newsreel: The first peg hammered plant. Women carrying on his head gravity. Works bulldozer, excavator, a passing car. Construction of pouring buckets of cement. Jawaharlal Nehru stands with workers of the plant. Standing Soviet and Indian workers. Banners at the plant at Bhilai in Russian and English languages. Members of the Soviet delegation, including the Chairman of the USSR Council of Ministers VE Dymshits, Minister of Construction of the heavy industry of the USSR NV Goldin and Chairman of the USSR State Committee for Foreign Economic Relations JP Ryabov talk with the workers of the plant, pass through the mill. The ruins of the temple. Streets of New Delhi, are people, the river and the building. Musicians on the background of the Palace of the President during a national holiday - Republic Day. Those people who had gathered for the holiday. Newsreel: Flag of the Republic of India. Says the president of Jawaharlal Nehru. Newspaper that reads Jawaharlal Nehru. The opening of a memorial plaque on the Square in Moscow, which was named after Jawaharlal Nehru; welcome; among the Presidium of the Indian Prime Minister Indira Gandhi. Indira Gandhi at the memorial plaque. Comrade VE Dymshits presents a copy of the commemorative plaque mounted on Moscow Square in honor of Jawaharlal Nehru, the Bhilai steel industry. The area of the city of Bhilai, passing workers. Eternal flame burning at the site of the body of Mohandas Karamchand Gandhi (leader of the national liberation movement). Members of the Soviet delegation in the shop of metallurgical plant in Bhilai. Rail and subway trains, which is based in Calcutta. Workers in the underground tunnel. Installation of Indian artificial satellite in Bhilai. Monument to Yuri Gagarin in Star City; Indira Gandhi at the monument. Indira Gandhi among the Soviet-Indian crew. The Soviet delegation at a reception at the President Zaila Singh; and Indian Prime Minister Indira Gandhi. Members of the Soviet delegation at the construction of metallurgical plant in Bonar among workers. The Soviet delegation visits other construction Metallurgical Plant in Visakhapatnam in Andhra Pradesh. Novokramatorsky Machine-Building Plant named after VI Lenin; departments of the factory. Said factory worker who works in India. CEO says Novokramatorsk plant Matsegora friend. Rolling mill "3600", the details of the camp. Members of the Soviet delegation at the opening of the plate rolling mill "3600" at the Bhilai Steel Plant. Indian workers at the mill; hand working. From the ladle pouring steel, coke oven. The rally at the central stadium in Bhilai; Indian girls in national costumes handed flowers to members of the Soviet delegation. Stadium, people in the stands. Says Minister of Steel and Mines India Salve. Says the head of the Soviet delegation, Comrade VE Dymshits.